There is evidence that reactive oxygen species (ROS) signalling is required for normal increases in glucose uptake during contraction of isolated mouse skeletalmuscle, and that AMP-activated protein kinase (AMPK) is involved. 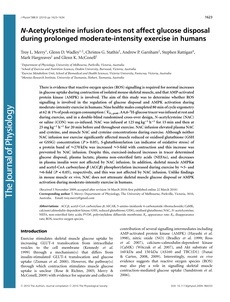 The aim of this study was to determine whether ROS signalling is involved in the regulation of glucose disposal and AMPK activation during moderate-intensity exercise in humans.Nine healthy males completed 80 min of cycle ergometry at 62�of peak oxygen consumption ( ˙VO2,peak.A6,6-2H-glucose tracer was infused at rest and during exercise, and in a double-blind randomised cross-over design, N-acetylcysteine (NAC) or saline (CON) was co-infused. NAC was infused at 125 mg kg−1 h−1 for 15min and then at 25 mg kg−1 h−1 for 20min before and throughout exercise. NAC infusion elevated plasma NAC and cysteine, and muscle NAC and cysteine concentrations during exercise. Although neither NAC infusion nor exercise significantly affected muscle reduced or oxidised glutathione (GSH or GSSG) concentration (P >0.05), S-glutathionylation (an indicator of oxidative stress) of a protein band of ∼270 kDa was increased ∼3-fold with contraction and this increase was prevented by NAC infusion. Despite this, exercised-induced increases in tracer determined glucose disposal, plasma lactate, plasma non-esterified fatty acids (NEFAs), and decreases in plasma insulin were not affected by NAC infusion. In addition, skeletal muscle AMPKα and acetyl-CoA carboxylase-β (ACCβ) phosphorylation increased during exercise by ∼3- and ∼6-fold (P <0.05), respectively, and this was not affected by NAC infusion. Unlike findings in mouse muscle ex vivo, NAC does not attenuate skeletal muscle glucose disposal or AMPK activation during moderate-intensity exercise in humans.